Google began approaching developers in October, offering few details about the promotion, other than the fact that each developer's chosen app would sell for $0.10 on a predetermined day during the promotion. Revenue for developers would be about $0.07 per download, which sounds low until one considers the impact of skyrocketing publicity and download numbers sure to result from the sale. It's important to note here that while the proposition sounds too good to pass up, there is still a risk involved with participation. While the offer was certainly alluring, and offered a guaranteed boost in sales during the promotion period, there was a risk that post-sale downloads would fall below pre-sale numbers. That being said, the publicity offered by Google's celebration is certainly worth a momentary lapse in sales immediately following the promotional period. I can't really share numbers, but suffice it to say, it went better than expected. With a game that normally sells for $2.99 marked down to ten cents, our game's downloads needed to be 30 times what they normally are to justify the discount on our end. 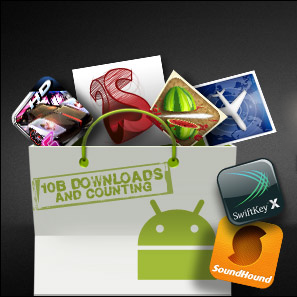 Our downloads during the sale were about 70x our normal, full-priced download rate. Simply astonishing. The next logical point of discussion centers around lasting effects the promotion has had on app sales. While numbers weren't immediately available for Paper Camera, our contact with Fieldrunners indicated that sales are still at about twice the normal rate experienced pre-promotion, due at least in part to publicity and sustained ranking in the Market. It is unclear what the long term ramifications of this promotion will be, but my guess is that numbers promoted apps will enjoy their new rankings for a while yet, and numbers will take a long while to even out again. The mark left by promoted apps' enhanced rankings will not only set the bar higher for incoming apps hoping to make the top ranking lists, but also make it easier for apps skyrocketed by the promotion to stay there. At any rate, apps involved in Google's promotion have no doubt experienced greatly enhanced sales, and continue to enjoy boosted numbers. There is no way of knowing when or if numbers will return to their previous state, but it is likely that increased sales and publicity will encourage the continued enhancement of promoted apps, keeping them in the top rankings for a while to come. Despite the (arguably avoidable) flaws in Google's 10 Billion App promotion that may have hurt those developers who were not invited to participate, I think that events like these have a net positive effect on the Android community, benefiting selected developers by promoting their apps with Google's mighty marketing power, and providing users with high-quality apps at greatly reduced rates. In an ideal world, we would continue to see promotions similar to this in the Android Market, with some of the less savory kinks worked out, and perhaps even more developers invited to participate.